Deep in southern latitudes, in a desolate corner of Cumberland Bay on the east coast of the sub-Antarctic island of South Georgia, hard by the rotting quays of the abandoned whaling station of Grytviken and almost within a stone’s throw of the grave of Sir Ernest Shackleton, lie three forsaken steam ships: rusting remnants of our industrial past, unique survivals from a vanished age of steam at sea. One of these ships is Viola, the sole surviving Hull steam trawler from the huge fleet which put 'fish & chips' on Britain's plates more than a hundred years ago. In this absorbing account, maritime historians Robb Robinson and Ian Hart describe her ancestry and origins in the Victorian and Edwardian North Sea fishery—vividly depicting life for her crew in the most dangerous industry of its time; they record her Great War service as a U-boat hunter—one of the many merchant vessels largely unsung for their contribution, and often sacrifice, in wartime; and they recount her subsequent career hunting whales off West Africa, then later sealing and exploration work in the South Atlantic, before her final abandonment in South Georgia. Here she became quarry for the infamous Argentine scrap metal expedition of 1982, in the initiating action of the Falklands War. 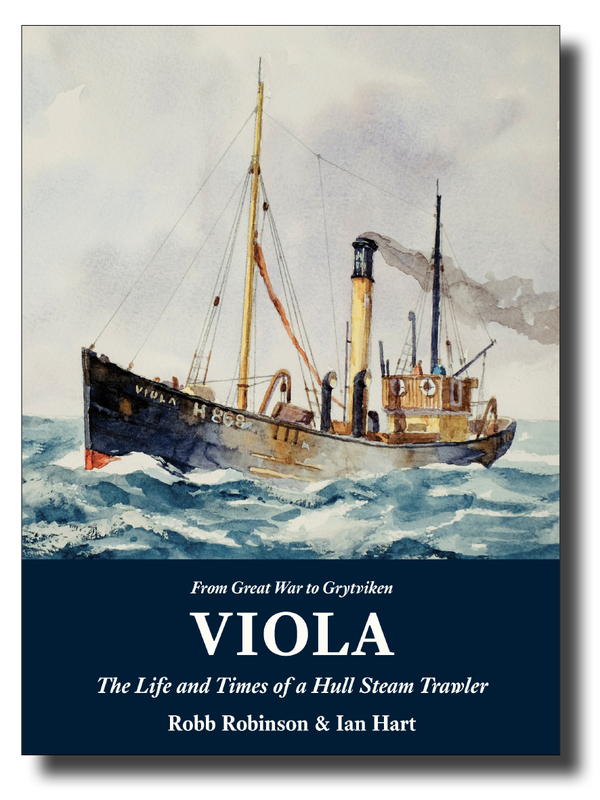 This improbable yet true story of a humble working vessel and those involved with her is a highly readable work of social, as well as maritime, history. ISBN 978-1-907206-27-6; 216 x 156mm, 224pp + 16pp monochrome & colour photographs; map, notes, bibliography, index. Softcover with sewn binding, cover flaps and matt lamination.